Hungarian journalist and author; born Dec. 20, 1843, in Heves, Hungary. He began to study medicine and classical philology in Budapest and Vienna, but soon turned to writing, and since 1865 has been an active journalist and author. 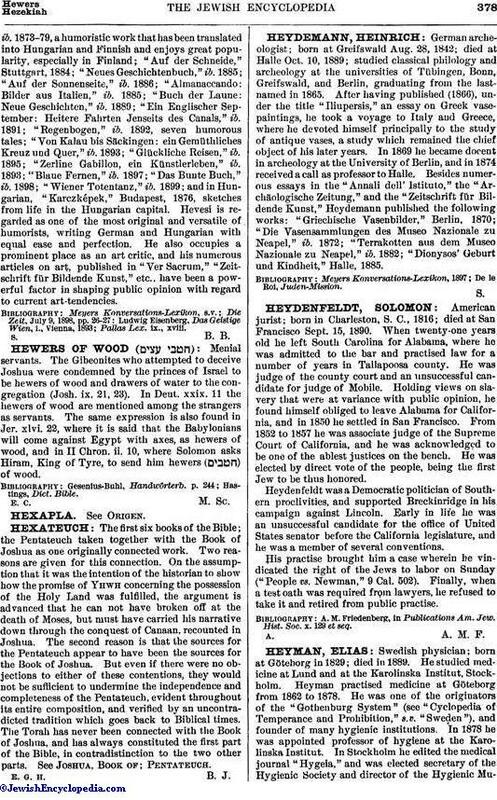 In 1866 he became engaged as collaborator on the "Pester Lloyd," and later on the "Breslauer Zeitung," for which publications he writes humorous feuilletons. In 1875 Hevesi settled in Vienna and became associate editor of the art department of the "Wiener Fremdenblatt." He also wrote the dramatic criticisms on the performances in the Hofburgtheater. During 1871-74 he edited "Kleine Leute," a journal for the young, the first seven volumes originating exclusively from his pen. In conjunction with a few friends he founded the Hungarian humoristic publication "Borsszem Jankó," which soon became a popular journal. 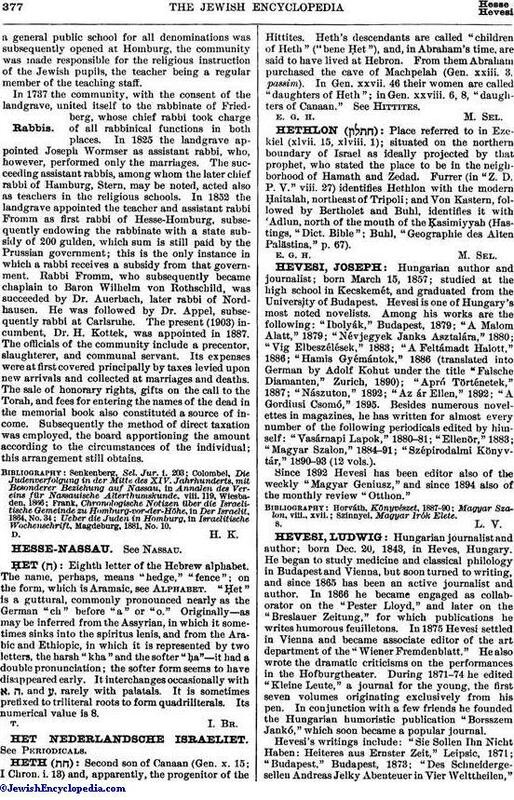 Hevesi's writings include: "Sie Sollen Ihn Nicht Haben: Heiteres aus Ernster Zeit," Leipsic, 1871; "Budapest," Budapest, 1873; "Des Schneidergesellen Andreas Jelky Abenteuer in Vier Welttheilen,"ib. 1873-79, a humoristic work that has been translated into Hungarian and Finnish and enjoys great popularity, especially in Finland; "Auf der Schneide," Stuttgart, 1884; "Neues Geschichtenbuch," ib. 1885; "Auf der Sonnenseite," ib. 1886; "Almanaccando: Bilder aus Italien," ib. 1885; "Buch der Laune: Neue Geschichten," ib. 1889; "Ein Englischer September: Heitere Fahrten Jenseits des Canals," ib. 1891; "Regenbogen," ib. 1892, seven humorous tales; "Von Kalau bis Säckingen: ein Gemüthliches Kreuz und Quer," ib. 1893; "Glückliche Reisen," ib. 1895; "Zerline Gabillon, ein Künstlerleben," ib. 1893; "Blaue Fernen," ib. 1897; "Das Bunte Buch," ib. 1898; "Wiener Totentanz," ib. 1899; and in Hungarian, "Karczképek," Budapest, 1876, sketches from life in the Hungarian capital. Hevesi is regarded as one of the most original and versatile of humorists, writing German and Hungarian with equal case and perfection. He also occupies a prominent place as an art critic, and his numerous articles on art, published in "Ver Sacrum," "Zeitschrift für Bildende Kunst," etc., have been a powerful factor in shaping public opinion with regard to current art-tendencies.